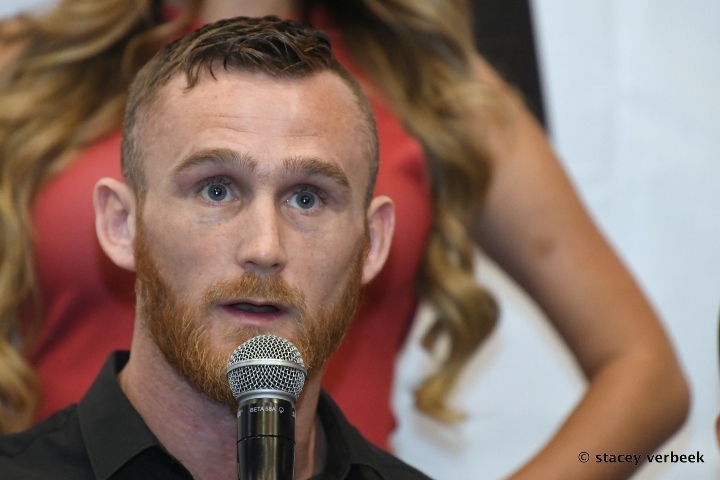 Nobody outside of his own team gave Dennis Hogan a shot at upsetting Jaime Munguia. Unfortunately for the 34-year old contender, the list of doubters also included the three ringside judges. The visiting boxer from Australia by way of Ireland turned in the best performance of his career, only to fall just short in a controversial majority decision defeat in their DAZN-streamed main event. Scores of 115-113 and 116-112 for Munguia and 114-114 even denied Hogan the upset win many felt he deserved Saturday evening on the road at Arena Monterrey in Monterrey, Mexico. “I knew I won the fight. I’m really disappointed to train as a hard as I did and for this to happen,” Hogan (28-2-1, 7KOs) told DAZN’s Chris Mannix. “We came here in good faith and no disrespect to the people who scored it but that decision shouldn’t go through. Hogan jumped out to a strong start while Munguia (33-0, 26KOs) struggled to find his rhythm while aiming to please the sold-out crowd of 17,000 in attendance for his first title fight in Mexico. The 22-year old from Tijuana hit his stride midway through the contest, but never to the point of befuddling Hogan who was fighting for the first time both in Mexico and for a major title. Just when Munguia thought he was going to pull away with the win, his determined challenger turned the tide at the worst possible time. Hogan landed right hands every time the defending titlist came forward, catching him with his chin up in the air but with the high-contact affair lacking any knockdowns. A strong final stand by Munguia ultimately sealed the win, although even without taking the 12th and final round he’d have still retained his title with a draw. That still would’ve been deemed unacceptable by his challenger, who insists that a second chance at a lasting impression is very much in his future. “Zanfer Promotions (Munguia’s promoter and current partner with Golden Boy Promotions) offered us one straight away,” Hogan insists. “They obviously know, everyone knows. I’m not one to cry, I’m not one to play, I’ll come back and win the title on neutral ground. I’ll win the title, set my family up.